Happy winter! Here's one more entry in my series of Field Guide illustrations too speculative to include in the book. It's now pretty widely known that remains attributed to the Campanian age genus Troodon have been found in the Maastrichtian age Prince Creek Formation of northern Alaska, which would have been above the arctic circle at the time. These animals have been featured in some recent TV documentaries such as March of the Dinosaurs. Though the remains are fragmentary and mostly undescribed, the fact that they are later in age than Troodon formosus, and in some cases twice the size of comparable T. formosus remains, it's a near certainty in my and others' opinions that these represent a new species if not genus of troodontid. unnamed Prince Creek troodontid species, by Matt Martyniuk. A staple of field guides to modern birds is to illustrate seasonal differences in plumage, which are widespread in cold climates. Of course, we don't currently have any information on plumage variation in Mesozoic birds, but the fact that this is one of the few Mesozoic species that may have regularly encountered snow made it too hard to resist adding this additional layer of speculation. 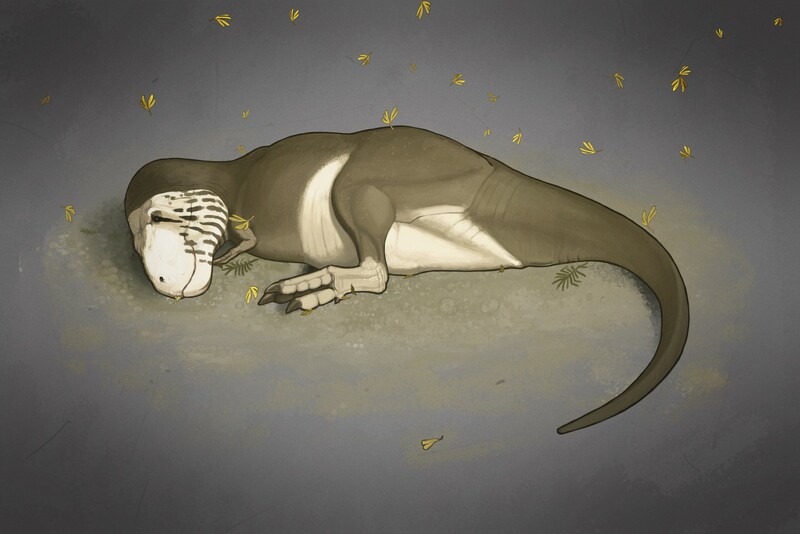 The problem with writing and illustrating a book covering hundreds of feathered dinosaur species is that it's easy to get on a roll, then get lazy. Specifically, there were one or two instances during the making of the book where I got cocky and finished the bulk of an illustration off the top of my head, only checking it against research later. In all of these instances, I ended up having to modify or flat-out cut the illustration while writing the explanatory text. So much for the info sitting at the top of my head! Luckily, in many cases I was able to salvage my work by tweaking the paintings in Photoshop to fit a different species, especially where the original was highly speculative to begin with. For example, I was really happy with my initial restoration of the tooth taxon Troodon asiamericanus, and with a few adjustments it now features proudly in the finished book as Linheraptor tani. I was so pleased with my restoration of the possible gigantic velociraptorine (err... itemirine) Itemirus that I chucked out my already-completed restoration of Achillobator (previously featured here), broadened the Itemirus snout, shortened the legs, and used that painting instead. However, there's one restoration I kinda liked a lot that didn't make it into the final book in any form. My original plan was to include some of the Lancian-age aviremigian taxa known from very fragmentary remains in the Lance and Hell Creek Formations. I have sitting on my HD right now restorations of Pectinodon bakkeri, the unnamed Scollard formation avimimid, and every named species of Cimolopteryx. I hope one day to complete a field guide style book about the Lance formation, so I probably won't share these just yet (though one of the Cimolopteryx made it into a figure in the finished book along with a few other rejected avians). What I will share is a restoration of a bird I mistakenly thought was a member of this fauna when I painted it. Above is my illustration of Zapsalis abradens, a small (juvenile?) 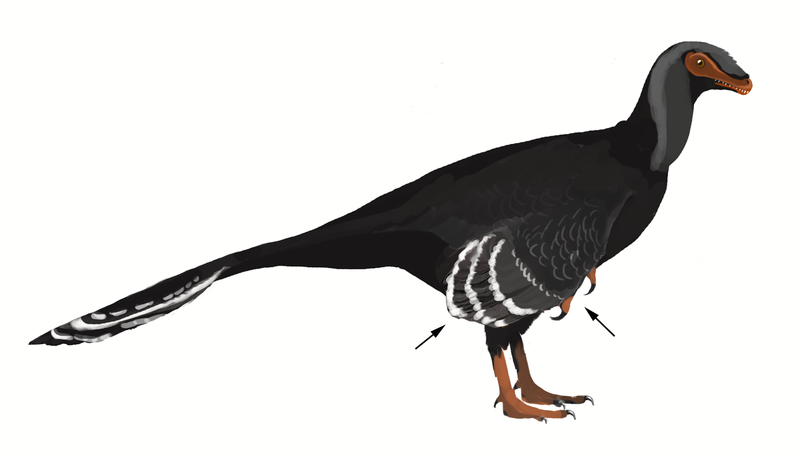 morph of eudromaeosaurs known only from a distinctive kind of tooth (inset). In my mind, I'd always associated this species with the Lance, and Zapsalis-like teeth have been reported from that formation. However, after finishing my painting (which I personally thought came out pretty adorable-looking), I went to do the writeup for it. Tooth taxa do require a bare minimum in the way of research before illustration after all, which is part of the reason why all of them ended up getting cut from the book as too speculative. Lo and behold, the holotype specimen, and indeed most specimens, of Z. abradens aren't from the Lance at all--they're from the Judith River/Dinosaur Park Formation! So, Zapsalis had two reasons to be cut. One, it was obviously far too speculative to include in a book focusing on comparing externally visible traits. Two, I had to admit that even the name itself is a bit dubious if it's from the DPK. Unlike the Lancian fauna, where no eudromaeosaurs have ever been named and so nothing competes for priority, there are several eudromaesaurs from the DPK. Is Zapsalis a distinct species? Maybe, but if not, it could represent a different morph of either Saurornitholestes or Dromaeosaurus. It would take priority over either name, but without any way to currently tell which (if any) it is, it's kind of a "nomen dubium". As announced in a few previous posts, Facebook, Twitter, the face of the moon and Geocities probably, my new book A Field Guide to Mesozoic Birds and Other Winged Dinosaurs is now available! The dead tree version can be had through Amazon or CreateSpace and a PDF version is also available for people who prefer to keep their library online/on disk via Lulu (for those of you reading this via RSS, click through to the Web article for handy links on the right side of the post!). In the interests of continued, shameless self-promotion, I thought I'd do a few blog posts highlighting a bit of the 'making of' the book; in this case, showcasing something that didn't quite make the cut and why. The first thing I did when switching gears from a guide to the complete ecology of a specific geologic formation to a broad overview of all known Mesozoic birds was decide which species to draw and which to relegate to the appendix. My original criterion, as suggested by John Conway (of All Yesterdays fame) was to include all "reconstructible" aviremigians. I suspect that by "reconstructible" he probably meant "known from a reasonably complete skeleton" but, stickler for completion that I am, I immediately broadened this to mean "anything that could be reasonably drawn based on phylogenetic bracketing." 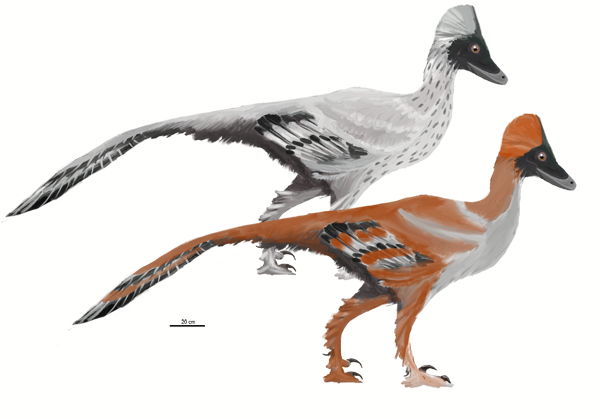 Perhaps understandably, this quickly got out of hand, forcing me to narrow the list down a bit, but not before I'd already painted (I kid you not) Dromaeosauroides and Troodon asiamericanus (the former complete with a tiny inset showing the single known tooth). While I liked the idea of including such never-before illustrated and highly speculative restorations, I thought that the spirit of the book demanded that I include mainly species that would have externally-visible distinguishing features. While there are still a few exceptions included, that is the criteria that produced the final book. One interesting situation was the few species which did have some externally visible features but are otherwise so phylogenetically ambiguous that most of the reconstruction would be pure fantasy. An example is shown above: Yixianosaurus longimanus. 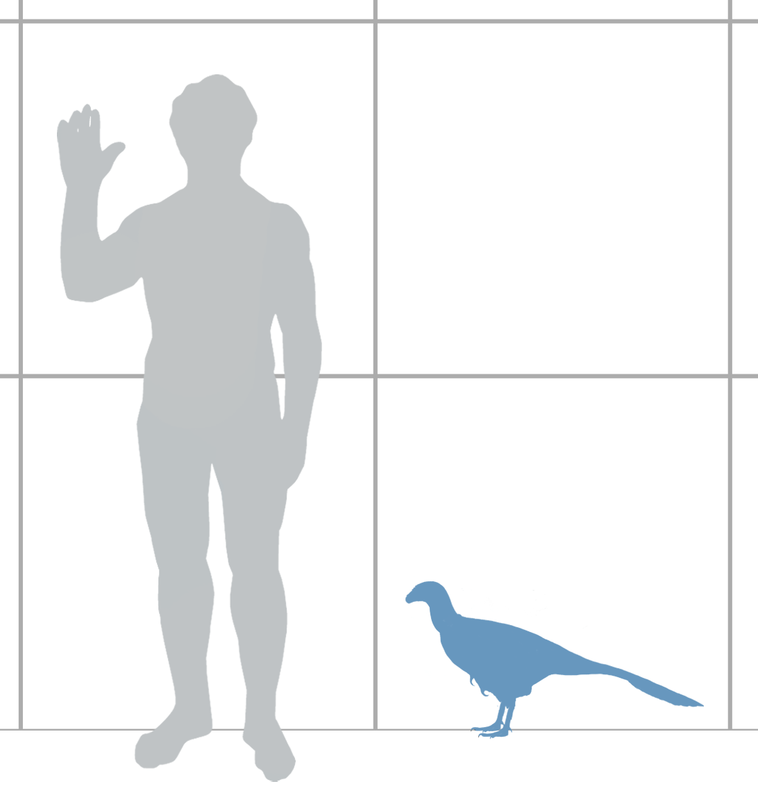 The fact is, despite have a complete forelimb complete with vaned feathers, we don't really have any idea what kind of aviremigian Yixianosaurus is. It's sort of the Deinocheirus of the 21st century. I had restored it basically as I'd imagine a very primitive oviraptorosaur would look, sort of like a cross between Ornitholestes, Falcarius, and Protarchaeopteryx, and it was originally included among the basal caenagnathiformes for lack of a better spot in the book. I'd probably have kept it in if we had complete wing feathers--that would be useful to diagram, at least for artists. But even their length is a guess. So, despite being possibly the most basal known member of the Aviremigia, I had to give this guy the axe. For me, one of the biggest biggest paleoart revelations in recent memory was seeing John Conway's digital painting of Diplodocus longus. Its Charles Knight-like "retro" atmosphere, scaly, lizard-like hide, and drooping tail betrayed every piece of received wisdom from the modern paleoart era, which Darren Naish has dubbed the "Age of Paul." Conway himself wrote in the description that the painting represented a "betrayal of the dinosaur renaissance" -- a move away from the sleek, slim, hyperkinetic dinosaurs of Bob Bakker and Gregory S. Paul and back toward a more subdued, naturalistic interpretation of prehistoric life. In some ways, the pendulum of the dinosaur revolution has swung too far in the hot-blooded direction. Certainly dinosaurs were not the cold-blooded swamp dwellers of the 19th Century, but guess what--many of them probably did live in swamps (including the swampy backwater environments preserved in the Jiufotang Formation) and I bet a lot of them relented to gravity and let their distal tails sag every once in a while; indeed, many of them may even have slept, and I'm not just talking about Mei long! While these statements may seem obvious, such scenarios are rarely portrayed in art. In their new book All Yesterdays, Conway, Naish, and C.M. Kosemen usher in a new age of paleoart, and solidify a paradigm shift that makes Paul's classic book Predatory Dinosaurs of the World look as, if not inaccurate, as outdated-seeming as 19th Century dinosaur artwork. The book points out that the anorexic zombie dinosaurs of the Paulian Age are not necessarily the most accurate portrayals of dinosaurs, and that depending on the vagaries of soft tissue preservation and the range of unusual and atypical behaviors found in modern animals, dinosaurs may have looked and acted quite differently from the way they've been shown for the past few decades. I've long been a proponent of this kind of re-imagining myself. When I first published my recent recon of Archaeopteryx, for example, many of the comments centered on how bird-like it looked relative to most other reconstructions. Really though, I thought it was pretty conservative--all I'd done was give it a reasonable amount of feathering, in an attempt to move it away from the half-bird half-lizard chimeras we usually see. But the stunning artwork presented in All Yesterdays is where the real avant-garde action is, from the tree-climbing protoceratopsids of the cover to the now-infamous, stylized painting of a rutting stegosaur attempting to mount a sauropod! The final section of the book is even more fascinating and often hilarious. Subtitled "All Todays," it imagines a world in which Quaternary period species are known only from fossils, and future paleoartists try to imagine what they would have looked like in life, mostly from a Paulian-style aesthetic of retaining skeletal outlines wherever possible with minimal soft tissue. All in all, All Yesterdays is an absolute must-have for anyone interested in the life appearance of dinosaurs and in the cultural context/assumptions inherent in how we reconstruct the past. The book is conveniently available in both eBook and print formats. I personally used the ibooks version for this review, which looks really great, but will definitely be buying a dead tree version in the future, as I think the gorgeous artwork it contains demands a place on my coffee table in all its large-format glory. All Yesterdays is available in paperback and eBook editions (the Kindle edition seems to come highly recommended on social media, and can be viewed with the Kindle app on iOS and desktop even if you don't have the e-reader). A Field Guide to Mesozoic Birds: Now Available! As you can see by the little ad over to the right of this post, my book on Mesozoic birds is now available in print and eBook/PDF formats! The book should be available in paperback from Amazon US and UK soon, and international distribution will follow soon after. For now, the paperback version can be purchased directly from CreateSpace and the pdf version from Lulu. Additional info and previews can be found here. As I discussed in my last post about the book, this field guide style summary of our knowledge of Mesozoic winged dinosaurs covers over 150 species and includes appendices on all known species as well as a revised classification and clade definitions. The Guide has been over two years in the making, so it's definitely nice to finally see it put together in its finished form! I'm pretty happy with the way the paperback came out, and I hope others will be able to get some use out of the anatomical guides and some enjoyment out of the life restorations. My primary goal with this book was to inspire people to see prehistoric birds as more than generic-looking set dressing for larger, more charismatic dinosaurs, and I have to say that it's pretty novel to have all well-known Mesozoic birds portrayed side by side. I hope this effort will help drive home just how diverse and varied in appearance these fascinating animals were! If you enjoy the book, I hope you'll help spread the word by sharing the links on Facebook, G+, and Twitter, and feel free to let me know what you think by writing reviews!